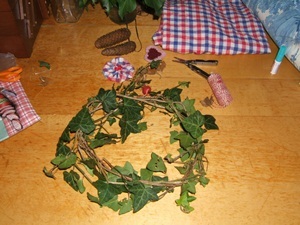 Wreaths made of ivy or other climbing plants like Virginia creeper are easy and quick to make. You can use them as simple green wreath or add some autumnal decoration. 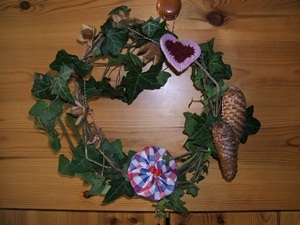 The wreaths usually stay nice for some weeks and you can adorn them depending on the occasion or season. Firstly we collect all our treassures on the table before we are starting. We love to make our ivy wreath in autumn. Autumn or Fall is our time for long walks and hikes. In our bag there is usually an additional bag or sometime we take a box for all the nice things we find when hiking. We do collect cones, beechnuts and sometimes nice stones, especially around Untersberg and Adnet you can find marble. Cut several twigs of ivy or other evergreen climbing plants. 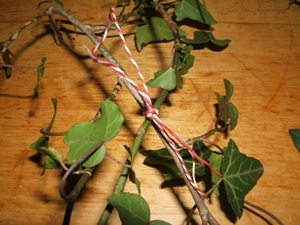 Young ivy twigs are not very strong, so kids can cut them with scissors. When crafting with kids we make sure that there are tasks for every kid. Take the longest twig and form a ring with a strong cord, now spin the ends around the ring. Take the other twigs and spin them around the ring as well. As these twigs are very flexible its easy to bind, and as they have leaves they will hold together in the ring. Now you can decorate the wreath as you like it. 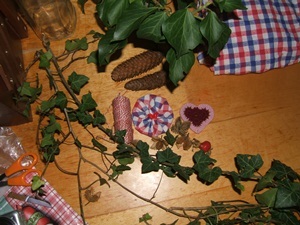 We chose a fabric yoyo and a heart made from the pattern Maria. You can further use fir cones, beechnuts and a rose hip, which we did knot onto a string to wrap around the wreath as well. As it was matching the fabric, the red of the rose hip and we like it for our autumn theme we used a string in red and white. You can as well use cotton yarn in a colour you like or a strong brown string. What else can you use to decorate your fall wreath or autumn wreath: pine cones, chestnuts – maybe already adorned as chestnut animals, deer and fawn made of salt dough and gingham ribbons. Choose what represents autumn for you and you might have some help from your kids to choose the perfect family autumn wreath decoration. A tip for placing the wreath: we like to use the wreath on the door of a cupboard. It is a cupboard which is large and of wood and we don't use it very ofther. If you put your wreath onto a door which is frequently opened and close make sure that the wreath can stand so much movement. On our front door we use a simple wreath with one decoration on top - usually a salt dough stag. This combination even stands smashing doors, which might occur when you have older children in your household with much energy and little time. Have fun making your own wreath – we would love to see photos, feel free to post your autumn wreath pictures on our facebook page. Crochet hearts in two colours using pattern "Maria"
Devilishly yummy cookies shaped as a little devil with cutter "Friedl"